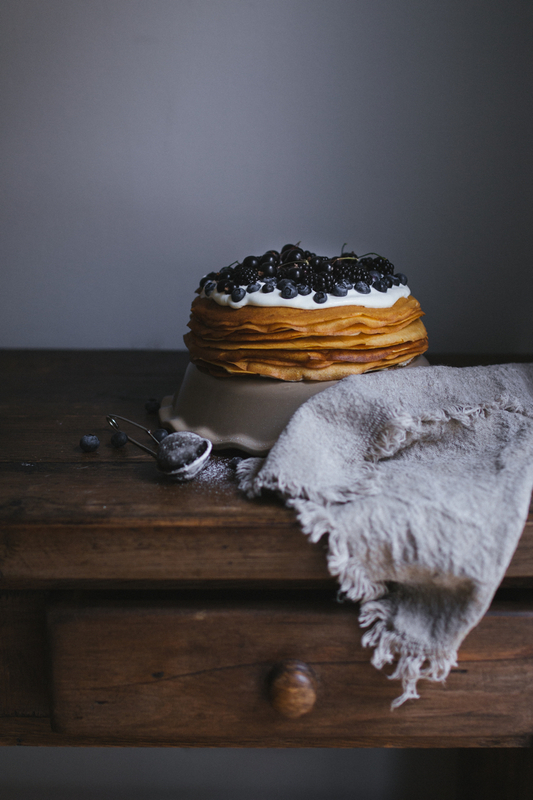 I love thin crêpes as you know, but making a cake with thin crêpes never crossed my mind. And when I’ve made this cake it turned out to be the easiest cake I’ve ever made. That’s true. It could be difficult if you have a bad relationship with thin-crêpes-making, but I can’t advice nothing but practice and buying good quality pan. 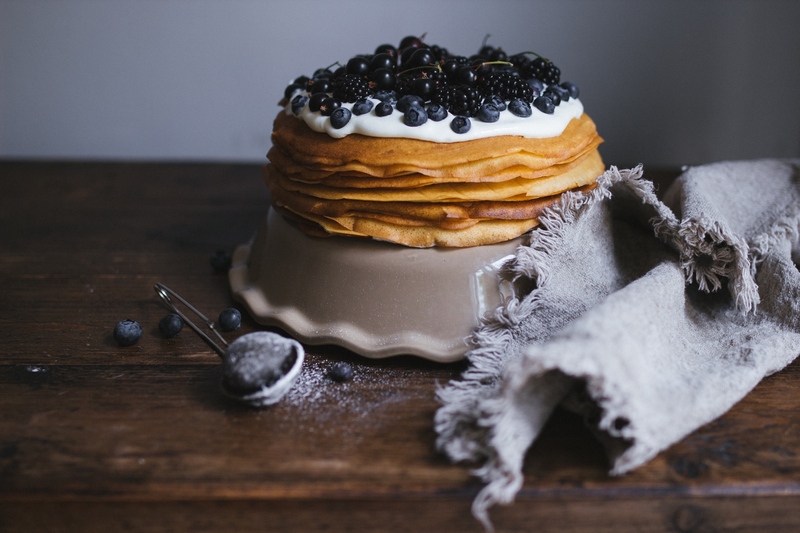 Make thin crêpes, experiment with adding liquid, changing thickness of crêpe batter. I’ve made huge amount of those thin crêpes and now I feel absolutely confident. If you only know how many crêpes were spoiled on that long crêpes way. 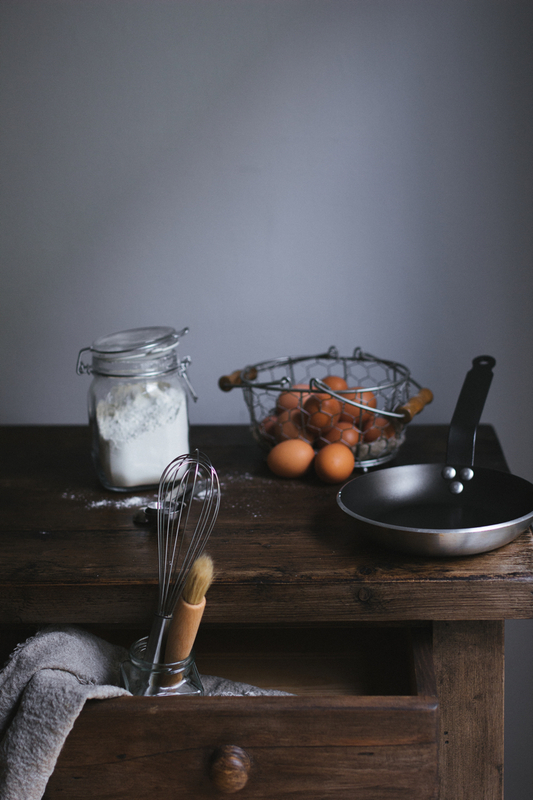 If you’re looking for a good recipe I could recommend my favourite batter recipe here. As a cream I used a mix of cream and mascarpone, adding condensed milk instead of sugar. 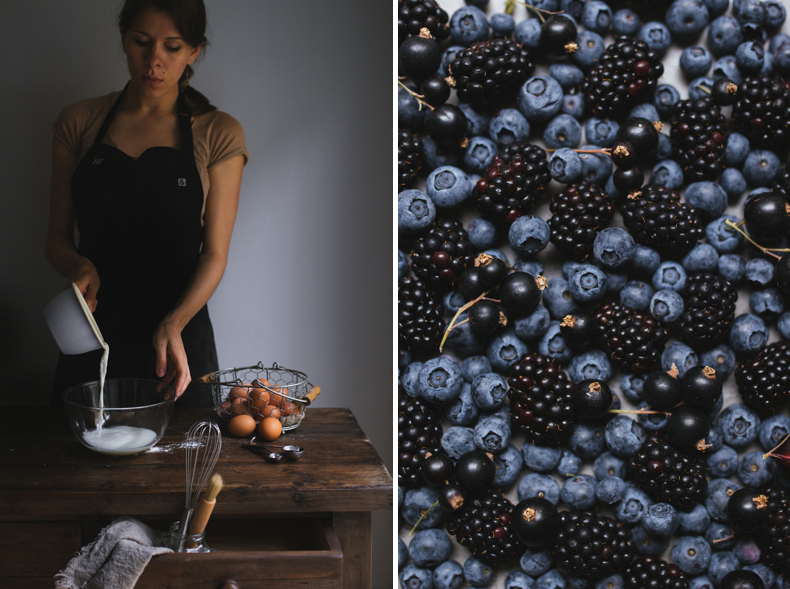 I topped the cake with fresh seasonal berries. Make the batter. Sift the flour and powdered sugar into the bowl. In another bowl whisk together the eggs, egg yolks, melted butter (cooled to room temperature) and milk. Add the flour continuing whisking. When the batter is smooth and without lumps set aside for about 20 mins. Make the cream. Whisk cold cream (the colder it is, the easier it will be to whip) in the big bowl. When the cream starts to thicken add the mascarpone and pour in the condensed milk gradually. Place the bowl with the cream into the fridge for about 20-30 minutes until it become thick and while you will make the crêpes. Use a small frying pan (I used 20 cm) to fry thin crêpes. Put them onto the plate. If you’re worried that crêpes might stick together than use pieces of parchment paper placing between each crêpe. Let them cool completely. 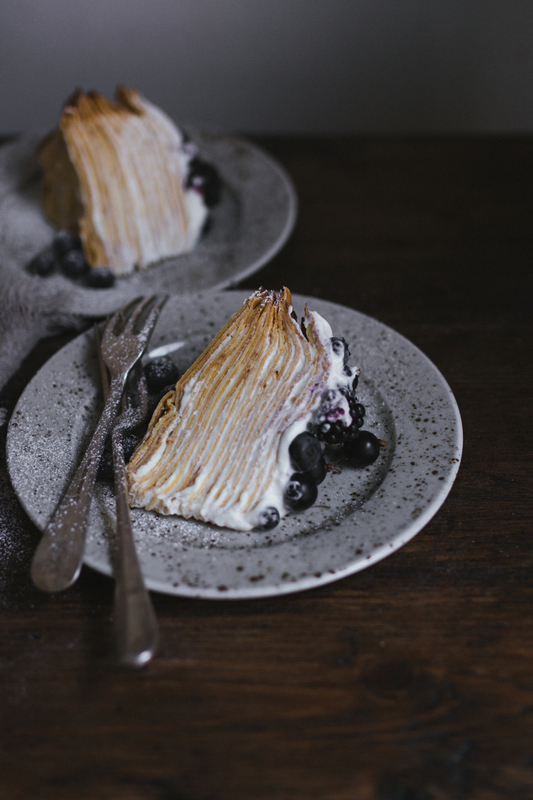 Place one crêpe on a plate or a cake stand and spread the cream over it. Cover with another crêpe. Repeat that until you are out of crêpes. The last one spread with the rests of the cream and top with the fresh berries. 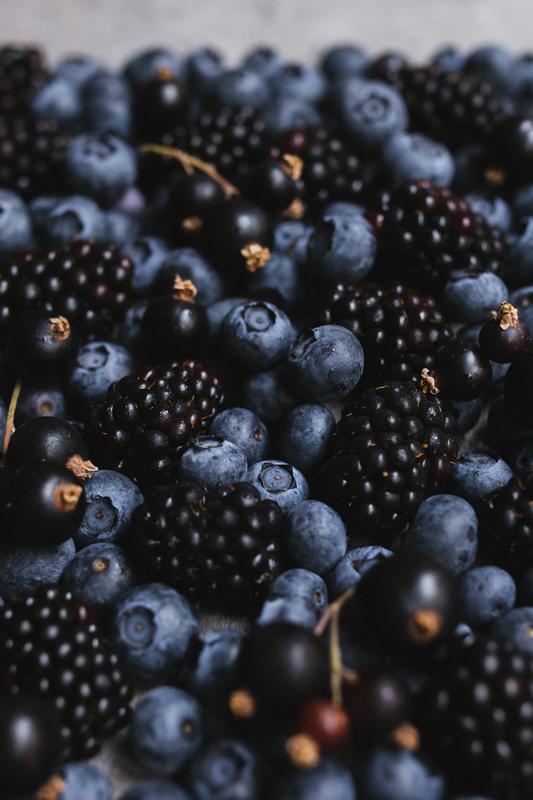 I used blackberries, blueberries and blackcurrants.You can use seasonal fruits as well. Let the cake cool in the fridge before serving (the cream should become thick) for about 30-40 minutes (or better leave it in the fridge overnight). The cake is very delicate so cut it using a well-sharpened knife. I always make the kitchen dirty with whipping cream, but cream is good as a filling)) It is also a good idea to use jam! maybe thin layers of jam. I started to think about chocolate crepe cake with salted caramel too. 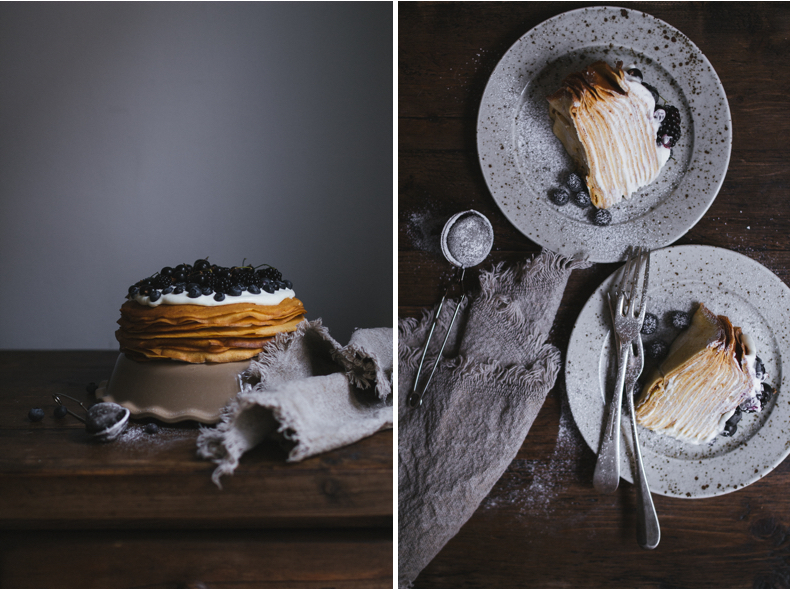 I love crepes and mascarpone too so this crepe cake is just perfect. Your pictures are amazing as always. this sounds so good! 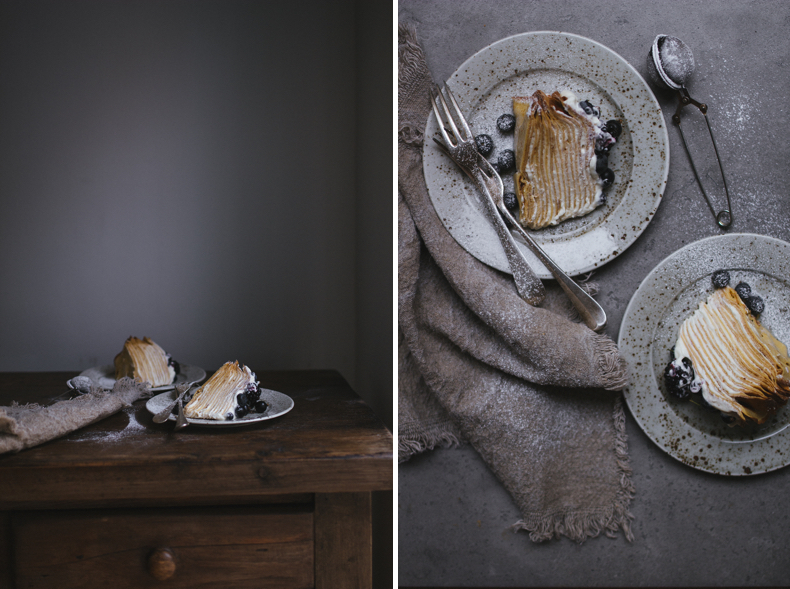 made a coffee crepe cake a couple weeks ago, but i found myself wanting something more simple and clean tasting, like yours seems like it would be. I have spent the last 45 minutes reading through your blog. What a gorgeous place you created. I love your photography and styling. That’s so pleasant to hear! Thank you very much. I’m happy you like it, welcome!